Published November 1, 2013 By Anna T. This post may contain affiliate links. Regardless, I only recommend sites I've researched and/or used and trust. If you are interested in doing some community moderation from home, Metaverse Mod Squad is a legitimate company frequently offering these positions. 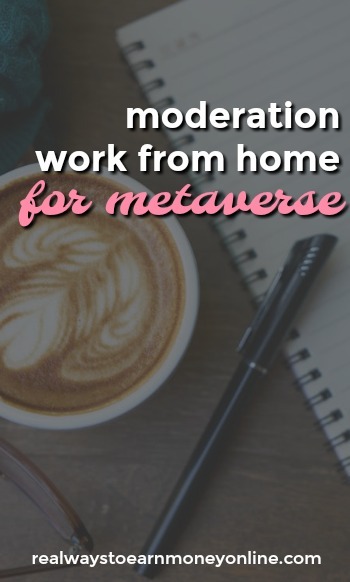 The people who currently work at home for Metaverse are bound by a very strict non-disclosure agreement, so many of the details you probably want to know regarding the moderation positions aren't available. But, I've done my best to provide as much information as I can for you so you can decide if this might be something to pursue. The application page at Metaverse does have a field for “Country,” so I'm thinking this could be open outside the US. It looks like there are three different types of moderation positions at Metaverse – content and engagement moderators, customer support reps, and social media professionals. The job description varies for each position, and you can read them all in detail here. And finally, the social media professionals handle all things social media (Facebook, Twitter, etc.) for Metaverse's clients. With the customer support positions, it looks like if you get a job offer, you'll either get put on phone and chat or email and chat. Some people have been offered a choice between the two. So this is not a guarantee of a non-phone job, although it could be just depending on what you're offered. What does Metaverse pay and when do they pay? Because of the NDA, there isn't much information regarding the actual rate online. However, some browsing online indicates that for moderators the starting rate is around $8 an hour. Payments are made monthly to contractors on the 15th. Your actual rate may vary depending on the position you're hired for. But most of what I can find online indicates it's not a lot better than minimum wage. If you have any moderation, social media, or customer service experience, you may have a shot at getting in here. Metaverse appears to also be open worldwide, and they made it clear on their “Become a Mod” page that knowing a foreign language is definitely a plus. If you don't have any of the above skills, apply anyway! You never know, they may be interested in you. And remember that customer service experience isn't limited to online customer service experience. Make sure your resume details any work you've ever done (online or offline) that could be considered customer service. After you fill out the online application, you'll probably get an email with an NDA (non-disclosure agreement). Receiving this does not mean that you for sure have the job. This is just something that Metaverse sends out to all potential workers because pretty much everyone on the forums that applied claim to have received this email shortly after applying. If you get lucky enough to have an interview, it will be done via Skype and you should find out during the interview whether or not you got the job. After you're offered the job, you'll have to wait for a background check to come back OK before you can start working/training. I can't confirm how long training lasts or if it's paid, and honestly I think this varies depending on what position you are hired for. Apparently the Metaverse mod positions are extremely flexible and you are free to schedule yourself for as many or as few hours as you want. You get to work basically when it's convenient for you. There are a lot of reviews posted about Metaverse at Glassdoor. Many of these people love the flexibility and the fact they get to work from home, but they don't like that the rate of pay is on the low side or that payments are made just once a month. Also, some people were upset about the fact that you can get dropped from a project with pretty much no warning. That makes me think that if you get this job, you probably need a work from home side hustle in place just in case something like that happens. As far as the work is concerned, most people seem to love it. It looks like that — as it is with most things — reviews are mixed. Metaverse may or may not need moderators at this time, but you can still apply here. If you don't hear back, try re-applying later. Some people over at Work Place Like Home reported that they heard back the second time they applied. If you are looking for similar positions, I have a huge list of work from home moderation jobs in my directory. I also recommend getting a subscription to FlexJobs, one of the only work at home job search sites on the web that is able to guarantee scam-free listings. I received an email to do a Skype interview, and all went well and was offered a job. First I had to pass a background check and do some pre hire paperwork. I have completed everything and am waiting on next steps, however it’s been two weeks now should I contact them? I signed up yesterday and got an email back today. It wasn’t a rejection letter, but they said they were going to see if my skill sets match with any companies. Fingers crossed! I applied for this company about a year ago, and this morning I received an email asking me to do a short assessment and list my availability. I hope they contact me back for an interview and hire me. I have heard nothing but great things about them. Tina, did you get the position? Leneka, yes I got the position, was scheduled to train and everything. Then all of a sudden the guy who interviewed me emailed me to tell me that my background check came back with undesirable results! I was like wait! What??????? I pass ALL of my background checks! So I emailed back to ask them what did they find that was bad? Of course they didn’t have enough decency to even respond. Not long after that I had an interview with Abc Financial, another WAH job. They told me i had the option to have my full background check results mailed to me. So I opted for that because I wanted to know what’s going on. I passed my background check with ABC Financial, and got hired. So, Metaverse must have either lied to me, or they do a credit check. And I do not have great credit. So for those who apply to metaverse, they may be doing credit checks which could disqualify you, and wont tell you till AFTER they hire you and get your hopes up! Yes, this is EXACTLY what happened to me, got an interview via skype, the guy I spoke with was really nice. NO mention of background check OR credit check. Got my paperwork to fill out, bam a background check AND a credit check, which mine is poor. So I haven’t gotten the results yet but i’m almost 100% sure they will not be hiring me. It’s a big let down, they should state that background AND credit checks will be pulled as to not get the hopes up of people that are desperately looking to get hired and earn some income. I know for a fact that when you sign the NDA and other Paperwork that let you know in it, they will be doing a full background and credit check. It was made known, they are required to let you know, because you have to agree to it. If you go to their “become a mod” page, it says this at the top – “You won’t find any cubicles in our shop! As a Mod in our network, you can work from any private location with secure high-speed internet access. You’ll select your projects based on YOUR passions – and schedule when YOU want to deliver. #modsnotcubes.” You can always double-check before applying, but they are pretty known for their work at home jobs. People on the Work Place Like Home forum have started some pretty extensive threads about them. I want to know if any open position for the website moderator. I have over 7 year experience in customer service and 2 years in website moderator. I am waiting for the opportunity and I will give my best. Thanks so much in advance. I never heard back from them and heard nothing but great reviews of there company. I applied in June of this year an again for another moderation position in August-September still nothing. I have entry-level in this so this would be new to me. I have heard they have hired non-experienced workers of moderation work. I am really hoping a position. will open up and be able to get on with this company as i can start asap. Thank you so much for this post! I read your blog a few times a week, and even the older posts provide me with useful information. I applied for some of the mod jobs on their website, around late September. Does anyone know if they hire a lot during the holiday season. I hope to be able to work with them in the near future. I don’t have a lot of moderation experience, but I do have over 1 year of telephone experience and 20 years of general clerical , computer and data entry experience. Thank you so much for posting this. I’m now just waiting to find out when I train. It looks like a fantastic opportunity and I’m very excited to get started. I never would have known about this job without your blog. I’ve shared it with my friends so that they can take advantage of your excellent resources. I applied for a position with this company after reading this site. I am soooo glad I did. Two weeks after I applied I was asked to complete an assessment and to give my availability, so I did. I was given an interview over Skype and told during the interview that I have the job. A week later I started working. I love it! Thanks for posting the information on this company. I love the flexibility. I am able to schedule hours how I want. Hours are plentiful, also. I had no experience in moderation and was hired. I hope this helps someone else. I applied a month or two ago back (if not longer) and received an email from Kelly asking if I was still interested. I responded with yes and then a day later she sent me a Non Disclosure to sign. After that she emailed back letting me know about a position with their Animal Jam program. It pays $8 per hour for emails and $9 per hour for phone calls. You pick your own hours between 6 and 6 PST. The email also contained to sample emails which I had to use their support site to find answers and email back to her as if I were responding to the email. The next day she invited me to interview. I had my interview via Skype voice call. It lasted about 10 minutes and was very informal. I was offered a job on the spot, which I accepted. They sent the paperwork via email and said training is paid and will take place over Skype. i received an email,they want me to confirm that i still want to work for them. I am interested of course.Waiting what to do next! Oh no! I am so sorry, Maggie. Maybe you can apply again at a later date? i applied and they send me agreement to work for them. i signed the agreement and now i am waiting for next step..